GSM testing machine is used for determining the weight per square meter of various materials like woven, non woven, knitted fabrics, films, papers etc. We manufacture GMS Testing Machine using high quality materials and supply them at specified requirements. This instrument cuts out rapidly and accurately 100 square centimeter piece of various materials. This GSM Testing Machine is made of high grade alluminum. 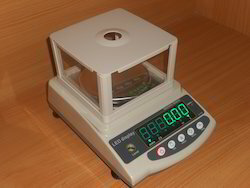 The Digital GSM Scale is used for the determination GSM of any fabric, Paper, Board. Laminated film etc. Our range of GSM Testers is manufactured as per international quality norms. 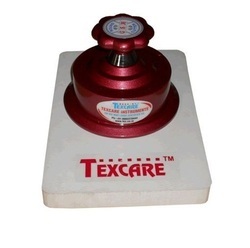 We offer heavy duty GSM Scales for industrial use and working with 24x7 continuously. 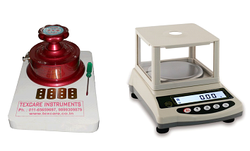 We are pioneer in market of various range of GSM round cutter and Digital GSM Balances. We offer digital GSM scale at market leading prices and is characterized by accuracy and user-friendliness. GSM scales are used in all industries like Textile, Paper and Packaging, Leather and Rexene, Woven and Non-woven Fabric Industry, Laminated paper film and fabric etc. This Digital GSM scale measures weight per unit area (Grams per square meter) & having accuracy of 1 GSM. Digital GSM Scale offered is designed for delivering precise and accurate reading and is made available with high contrast LCD display option for easy handling of the system. 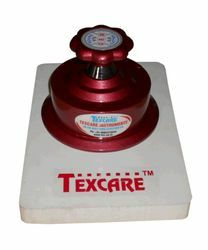 With these scales available in compact and space saving finish, these can be operated on adapter and have capacity of 300 gm with least count of 0.01 gm. The other specifications include platform size of 130 mm, power of 12V 300 mA AC Adaptor, LED Digital display, In-built battery backup, Acrylic cover and working compatibility with GSM balance. 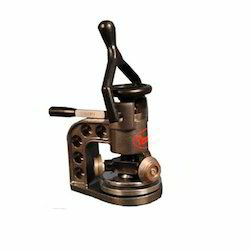 Cut & Fit GSM Round Cutter offered with precision finished and superior grade aluminum & brass blades as well as other associated metal parts that ensures uniform cutting of woven, non woven as well as knitted fabrics. These specialized cutters finding usage in the process of determining the GSM of the product and besides fabrics cutting, the offered cutter system is suitable also for cutting carpet, paper products and board products. Further, as these cutters are freely rotatable, these also do not require much effort in operations. For safety purposes, the cutter also comes with a locking device which is engaged while the cutter is not in use. GSM Round Cutters offered comprise specialized instruments that find usage in determining GSM (Grams per square meter) of textiles material including woven, non woven as well as knitted fabrics. Besides fabrics, these GSM Round cutters can be easily used for any type of materials including Carpet, Paper, Film, Foam and Board and feature main body of quality aluminum casting that provides for light weight finish. Further, these GSM round cutters can deliver diameter of sample cut of 113 mm with area of sample cut being 100 cm2. These are also made available with catch lock for operational safety and come with diamond shape cutting on bottom so as to ensure proper grip on the fabric. We are engaged in manufacturing and exporting of complete GSM Kit and GSM testing solution. This GSM Kit is used to determine GSM (Grams per square meter) of any Fabric, Paper, Board, Leather, Laminated Sheets and other sheet material. We are a popular company known for providing GSM Testing Machine to the clients. GMS Sample Cutter is used to determine GSM (Grams per square meter) of any fabric (Woven, Non-woven or knitted), paper, Laminated films, leather, and board. We are offering a GMS Cutter to our clients.